Follow up of last years discussion topic! The original 2015 Discussion thread was lost recently so I decided to put it back up again because I started last years discussion as well. I can't wait for another fun year at Kings Island and I can't wait to read all the great things you guys have to say! does anyone know if the park will have a construction tour, that would be really cool if it did! Snoopy's Splash Dance May Dance In Peace. It's Already Ripped Up And Gone! Since a place like Kings Island tears out things they've built (usually) more often than the average construction project, I wonder if they use any special techniques when they build something that will make it easier to tear out at the end of its life cycle. Just to re-post this, ERT for 2015 will reintroduce Diamondback into the line up along with both new rides in Planet Snoopy and Banshee. Maybe that passholder special preview they talked about? This is the last weekend of the holiday season pass sale. The "Buy Now Pay Later" option goes away Sunday night, and prices may go up. Platinum prices will almost certainly increase to match those at Knott's Berry Farm, where the sale already ended. Almost halfway through KI's off season! We made it this far, we can make the final stretch! I like the put Diamondback on ERT. With it and the new rides on it, Might be some short lines in the mornings. able to ride both Diamondback and Woodstock Fliers in ERT. 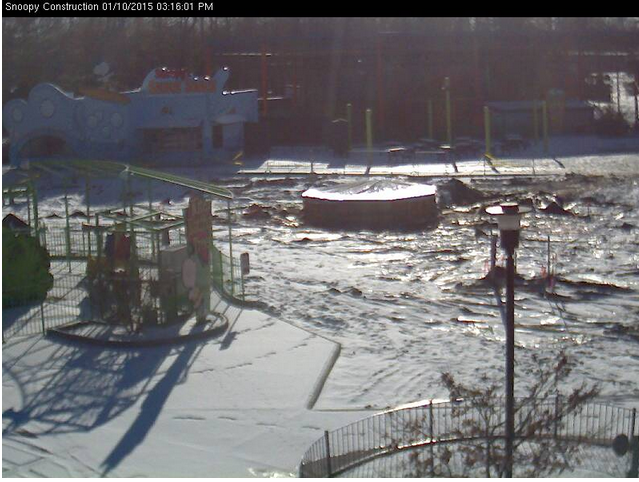 Hopefully Boo Blasters will still be running for it as well and maybe Surf Dog, then I can get all my rides in that area before the park opens then head around through the backside then. ^^ Paging standbyme... wherever he is. My dad uncovered a stack of old photo prints of me at KI in the early Paramount days, from multiple visits. I need to stop being lazy and sort, scan, and upload them. I hope to have that done within the next month or two. Precisely my point. I hope to have them posted by the end of the offseason. I wonder if they mean the print one or the interactive ones. I originally interpreted it as print, but reading it here it occurred to me they might mean their new technology in-park. YEa I'd guess the new in park tech. Probably the touch screen maps and the GPS map on their app. I don't see what all you could really change from the print map to make it easier to follow than it is now, aside fomr making it more realistic drawing buts don't think that's going to have much change on finding your way around. I hope more of them are installed, including at other CF parks (cough cough Cedar Point). Granted they were installed after my KI visits last year, but they seem awesome! I'm not sure if it's the electronic maps or the paper ones. Traditionally, the paper maps have been referred to as the "Park Guide" so it would be in line with what we've seen in the past if that's what he was referring to. Then again, there's no reason the electronic ones couldn't be referred to as a "Park Guide" so, it could certainly be that as well. I would guess that the changes are not with the actual map itself. I think those are made by a third party or by designers working for Cedar Fair rather than the park, since all the Cedar Fair parks share a common style map. But they could certainly add some descriptive text to the guide portion of the park guide. For example, directions relative to major attractions that are easier to find. Something along the lines of, "Subway locations can be found in Coney Mall to the right of The Racer's entrance, or in Soak City near the Tropical Twister" might be more helpful than just numbers on a map. Then, if you know where Racer is, there is no need to search the map for Subway. I can agree with this. As I see it, there's one perk to Subway being there, and that is that you can smell it when they are baking their bread from the Red Racer station, and I enjoy the smell of bread being baked. Can't say I've had Subway at the park in, well, ever. Assuming it's the same quality as Subway outside the park, it's decent food, but I'm not going to pay that when I can get much larger portions for the same money at nearly any other food location. But it isn't. Only the lower end/cold subs are available. And they are seldom made correctly. I'd rather have botched funnel cakes than the park's Subway. Meatball? No. Flatbread? No. Subway? I just say no at KI. Quality is the same from my experience, but they have limited meat choices, a limited selection of breads, veggies, and sauces, and at the one next to The Racer, no microwave or toasting oven so you can only get cold subs (the one in Soak City has one or two more meat options as well as microwaves and a toasting oven). EDIT: It's not just "lower end" subs. They have some of the ones that are more expensive at a regular Subway as well.